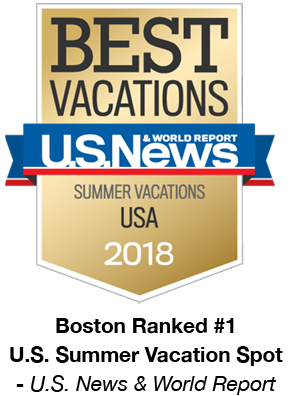 Summer is a great time to explore Boston, Massachusetts. Affectionately known as "America&apos;s Walking City," you can stroll the city&apos;s sidewalks, wander its abundance of green parks, or just people-watch at one of the many outdoor cafes. Don&apos;t miss the Boston Pops when they ring in the season with the 4th of July celebration on the Charles River Esplanade. Shoppers will love Boston&apos;s Faneuil Hall Marketplace and the high-end boutiques on Newbury Street. For sports fans, catching a Red Sox game at Fenway Park is a must when you&apos;re in Boston. North of Boston and on Cape Cod, picturesque New England beaches are frequented by locals and visitors alike, and the colonial towns hum with the bustle of eager explorers. When the sun goes down, ideal temperatures make for a hot nightlife in the city&apos;s restaurants, bars and clubs. That&apos;s Boston in the summertime. The city at its best and brightest with plenty of summer deals to help you do it on a budget! Revere Beach National Sand-Sculpting Festival This free and open to the public event draws crowds from all over New England. Dell Technologies Championship at TPC Boston New England's premier PGA Tour FedExCup Playoff event held over Labor Day weekend. Day: If you're touring, wear comfy sneakers or sandals for walking. Shorts and T-shirts are common. Bring sunglasses or a hat. Most tourist venues don't have dress codes, but check to be sure. Evening: Consider your agenda; the theater tends to be dressier and some upscale restaurants require jackets.